The server environment is a Windows server (or laptop) with IIS and Sql Server (including express) installed. There are several scenarios with slightly different requirements. We have focused documentation primary on these use cases. Download and install the Configuration Tool from http://contensive.io/downloads. This installs two features, the command line configuration utility and a windows service for managing background tasks. Use the configuration tool to first configure a Server Group, then to create an Application in the Server Group. Start a command prompt as administrator and change directory to c:\Program Files (x86)\kma\contensive5. For help using cc.exe, run cc with no arguments. For status of the current Server Group, run >cc --status . To change a Server Group configuration, you can re-run this command at any time. Create an application in the Server Group. An application is the solution you are creating. It might be a website with one or with 100 servers, or it might be a database program that processes data periodically. If your application is online, this will be the path you use for the administration site (where you edit data). The default is "admin"
This is the file folder where the website files like scripts will run, typically wwwRoot. Enter to accept the default local path. You may choose later to develop your own IIS application that calls the Contensive library although that isn't necessary. 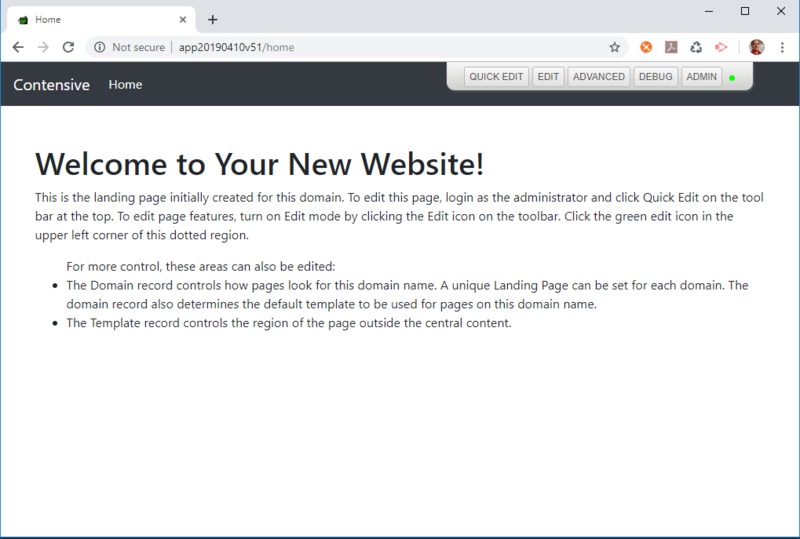 The default IIS application supports endpoints for the administration site and for all remote methods addons you create. Select the downloaded default website and complete the import. Open Windows Services and start the Contensive Task Service, installed with the configuration tool.